The Quiet Time: Door County in Winter. 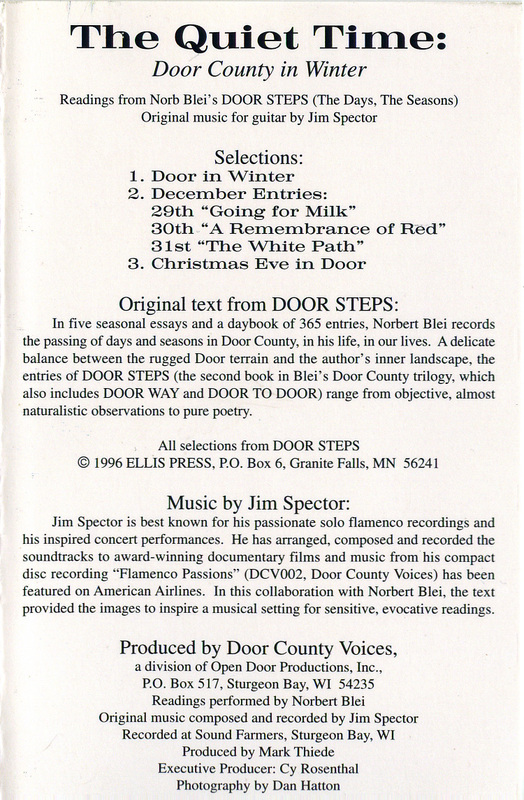 Readings from Norb Blei’s DOOR STEPS (The Days, The Seasons) Original music for guitar by Jim Spector. 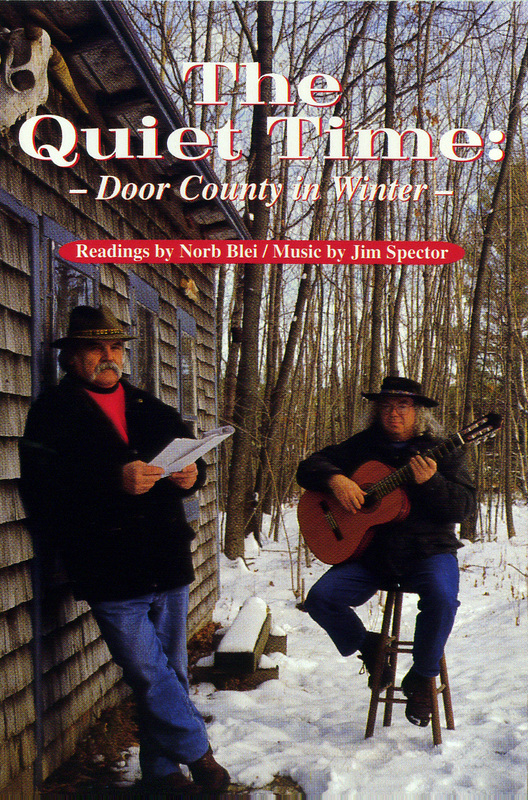 In five seasonal essays and a daybook of 365 entries, Norbert Blei records the passing of days and seasons in Door County, in his life, in our lives. 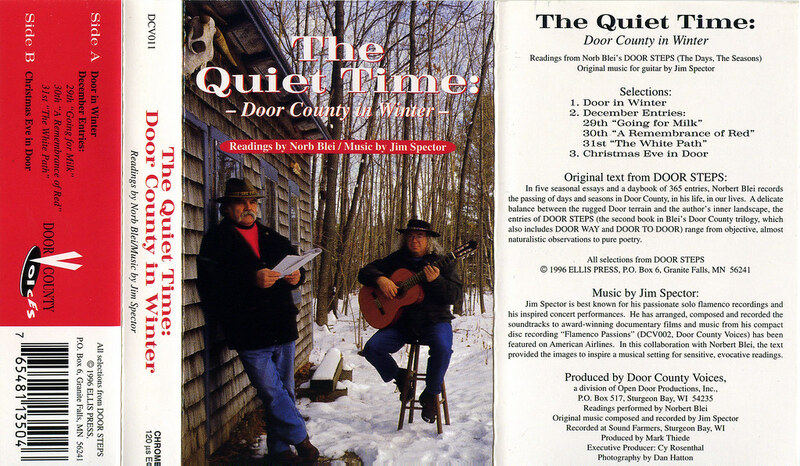 A delicate balance between the rugged Door terrain and the author’s inner landscape, the entries of DOOR STEPS (the second book in Blei’s Door County trilogy, which also includes DOOR WAY and DOOR TO DOOR) range from objective, almost naturalistic observations to pure poetry. Jim Spector is best known for his passionate solo flamenco recordings and his inspired concert performances. He has arranged, composed and recorded the soundtracks to award-winning documentary films and music from his compact disc recording “Flamenco Passions” (DCV002, Door Couniy Voices) has been featured on American Airlines. In this collaboration with Norbert Blei, the text provided the images to inspire a musical setting for sensitive, evocative readings. Produced by Door County Voices, a division of Open Door Productions, Inc., P.O. Box 517, Sturgeon Bay, WI 54235. Readings performed by Norbert Blei. Original music composed and recorded by Jim Spector. Recorded at Sound Fanners, Sturgeon Bay, WI. Produced by Mark Thiede. Executive Producer: Cy Rosenthal. Photography by Dan Hatton. Editors note: This recording was originally released as cassette and is not longer available. Norbert Blei was so kind to send me one of the very last un-played tapes. Digitalized as mp3 in 320kps | 44100hz | Stereo quality by Markus Mayer in Vienna, Austria. This download consists of one 62.27MB zip file containing the complete track list in 320kbps MP3 format along with album art in high resolution JPG format.